We will use the 300/5000 grating tilted at an angle of 6:00 degrees. We will use 150 and 450 microns for the narrow and wide slit, respectively. Both grating tilt and slit width are set manually. In order to avoid second order contamination in the red region of the spectrum, we will use a GG495 blocking filter, which should be in the filter holder, and has to be placed in and out of the beam manually. The staff members can instruct you about these matters. Note the blocking filter should be used for blue bright targets (i.e. supernovae with an exposure time of 5 minutes or less). If the blocking filter is used for any targets be sure to observe standard stars with and without the blocking filter. Its use is recommended for bright blue targets (such as young type I supernovae) in which second order blue contamination in the red par of the spectrum may be an issue. Turn ON the quartz light adjust voltage to 480. Take a sequence of dome flats with each slit width. Take a sequence of bias frames. By setting ExpType=Bias ExpTime will automatically go to 0s. Set loops=10. Ask NA to slew the telescope to the object coordinates and to move the Cassegrain Ring in order to have the slit along the parallactic angle (see table at the control room or execute the task bpangle in the IRAF bnc packge in clarity). The night assistant will place the object on the slit, but it should not be right in the middle (there's an arrow pointing to it) because the comparison spectrum has a gap there (in between the prisms) and it will be difficult to work with it during the reduction process; some 20 pixels apart from the center is enough, although you can place it further away if wanted. 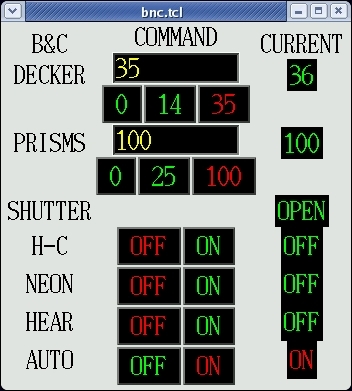 To take a comparison you only have to turn on the HeAr and Ne lamps in the bnc GUI; and wait until the prisms position reads 0. A 20s exposure will be fine for lamps. As aforementioned you may want to use the GG495 blocking filter for bright targets. If so then first make a sequence without it, and then go to the spectrograph, push the filter into the instrument/beam path and take another sequence of the target. Before observing a spectrophotometric standard, open the slit to 450u. If any targets were observed with the blocking filter make sure to make a sequence of the standard stars with the blocking filter in place. Do not take comparison lamps through the wide slit! As noted in the exposure time webpage we request that one telluric standard is observed with a NARROW slit and high signal-to-noise. 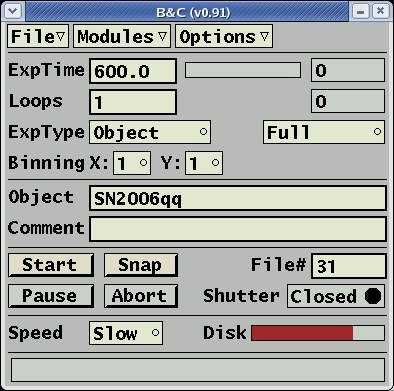 Follow this exposure with a comparison lamp. See the exposure time page for a list of normal and telluric standards. If one is looking for a spectral atlas for identifing arc lamps we refer you to the IMACS webpage. There you can find decent charts that will enable you to identify the HeArNe lines.